Although laboratory rats are often considered classic nonseasonal breeders, peripubertal rats of two inbred strains, F344 and BN, have both reproductive and nonreproductive responses to short photoperiods. Unmanipulated adult rats have not been reported to have robust responses to short photoperiod alone, although several treatments can induce photoperiodic responses in adults. In this study, we tested the hypotheses that unmanipulated F344 rats retain responses to short photoperiod as adults and that they have the necessary elements for an endogenous circannual rhythm of sensitivity to short photoperiod. Relative to rats kept in long photoperiods (L16:D8), adult F344 rats transferred at 4.5 months of age to short photoperiods (L8:D16) had significantly lower testis size, food intake, and body weight. In a second experiment, newly weaned F344 rats underwent an initial period of inhibition of reproductive maturation, lower food intake, and lower body weight in short photoperiod or intermediate photoperiod (L12:D12) relative to rats in long photoperiod. By 18 weeks of treatment, rats in the two inhibitory photoperiods no longer differed from long photoperiod controls. In short photoperiod, rats underwent a second period of slight reproductive inhibition between weeks 35 and 48, but there was an effect on body weight and slight inhibition of food intake only in an intermediate photoperiod. Male F344 rats retain photoresponsiveness as adults, with less reproductive inhibition but equivalent nonreproductive responses. There was only weak evidence for an endogenous timer controlling a circannual cycle of sensitivity to short photoperiod. Most mammals in the temperate zones undergo seasonal changes in physiological state . There are two mechanisms mammals can use to regulate responses to seasonal change. The first is direct responsiveness to an environmental cue (or cues) for time of year, most commonly seasonal changes in photoperiod. The second is an endogenous circannual rhythm entrained by an environmental cue(s). Endogenous circannual rhythms may serve to protect the timing of seasonal functions from noise in environmental cues , and may improve seasonal timing by buffering variation in the detection or measurement of even the most reliable environmental cues, including photoperiod. Laboratory rats have been considered the classical model of an opportunist, nonseasonal breeder, responding almost entirely to immediate conditions to regulate reproduction and physiology. However, recent work shows that laboratory rat strains vary in their responsiveness to photoperiod [3–6]. Laboratory rats of some strains can be manipulated to unmask responses to photoperiod or melatonin, even though short photoperiod alone does not affect reproduction [7–9]. Peripubertal rats in the inbred Fischer 344 (F344) and Brown Norway (BN) strains are naturally sensitive to reproductive inhibition by short photoperiod alone [4–6]. In several species of rodents, peripubertal young have stronger reproductive responses to photoperiod than adults [10–13], and this appears to be true for induced-photoresponsive laboratory rats as well . It is unknown if responsiveness to short photoperiod persists into adulthood in strains of laboratory rats that are naturally sensitive to short photoperiod, and if so, whether these strains also have any endogenous rhythm of responses to short photoperiod. In this study, adult F344 rats were first tested for responses to short photoperiod. If F344 rats are photoresponsive, we predicted that adult rats treated with a short photoperiod would exhibit a decrease in testis size, body weight, and food intake. In addition, adult F344 rats were tested for evidence of an endogenous rhythm of photoperiodic responses, by assessing whether mature rats that had become insensitive to short winter photoperiods would regain sensitivity in constant short photoperiod. If they have such an endogenous rhythm, we predicted that F344 rats treated from weaning with a constant short photoperiod or an intermediate photoperiod (L12:D12; INT) would exhibit an initial decrease in testis size, body weight, or food intake, followed by a refractory period with no differences relative to a control group in long photoperiod, and then a second period of sensitivity to shorter photoperiods, again relative to a control group in long photoperiod. Here we report that adult F344 rats retain both reproductive and nonreproductive responses to short photoperiod, and that there is weak evidence for an endogenous circannual rhythm of reproductive responses to short photoperiod in F344 rats, but not such a rhythm for non-reproductive responses to short photoperiod. Repeated measures ANOVA on estimated testis volume over weeks 2–16 of short photoperiod treatment (L8:D16; SD) revealed a significant interaction between measurement week and photoperiod, (P = 0.001, F = 4.09), indicating that SD treatment produced differences between the groups over time (Fig. 1a). T-tests for individual weeks indicated a significant difference after 8 weeks, and this result persisted through the time of the last measurement after week 16 (Fig. 1a). SD treatment resulted in a maximum difference in testis size of approximately 15% after 10 weeks of treatment (Fig. 1b). Running three-point means of estimated testis volume (± SE) (a) and means transformed to a percentage of the LD mean value (b) in adult F344 rats over 16 weeks in LD or SD. Asterisks indicate significant differences at P < 0.05 in tests on both the raw data and the data converted to percentages. Repeated measures ANOVA on body weight over weeks 2–16 of treatment revealed significantly lower body weights in SD (P < 0.0001, F = 54.83; Fig. 2a). There was a significant interaction between measurement week and photoperiod treatment (P < 0.0001, F = 35.33), indicating that SD treatment produced differences between the groups over time. Body weight responded very rapidly to SD, as one-tail t-tests for individual weeks revealed a significant difference in body weight from week 2 through the time of the last measurement at week 16 (Fig. 2a). Differences in body weight were created by slight reductions of body weight of rats in SD, while rats in LD gained body weight steadily throughout the 16 weeks (Fig. 2a). 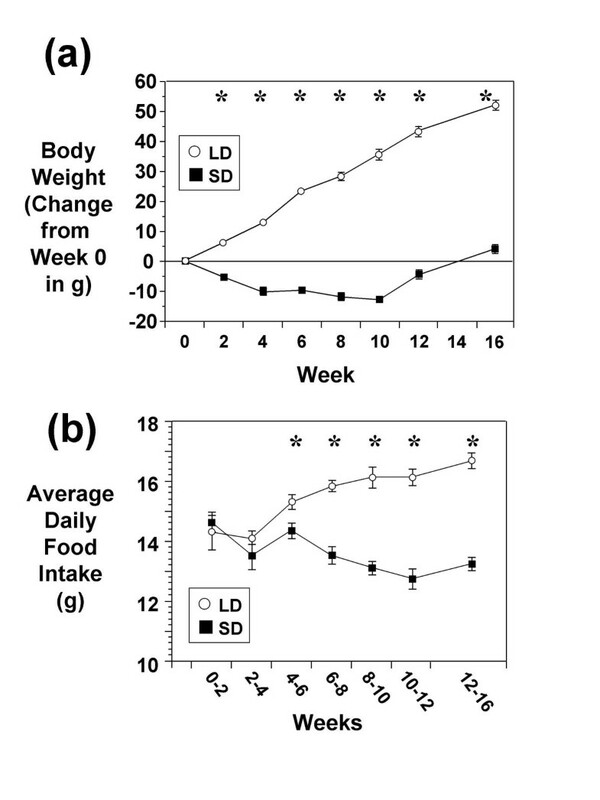 Mean ± SE of change in body weight (a) and mean ± SE of daily food intake (b) in adult F344 rats over 16 weeks in LD or SD. Mean body weight at Week 0 was 333 ± 4 g for each treatment group. Standard error bars are not shown for data points in which error bars were smaller than the symbols. Asterisks indicate significant differences at P < 0.05. Repeated measures ANOVA on food intake over weeks 2–16 of treatment revealed significantly reduced food intake levels in SD (P < 0.0001, F = 53.07; Fig. 2b). There was a significant interaction between measurement week and photoperiod treatment (P < 0.0001, F = 13.26), indicating that SD treatment produced differences between the groups over time. 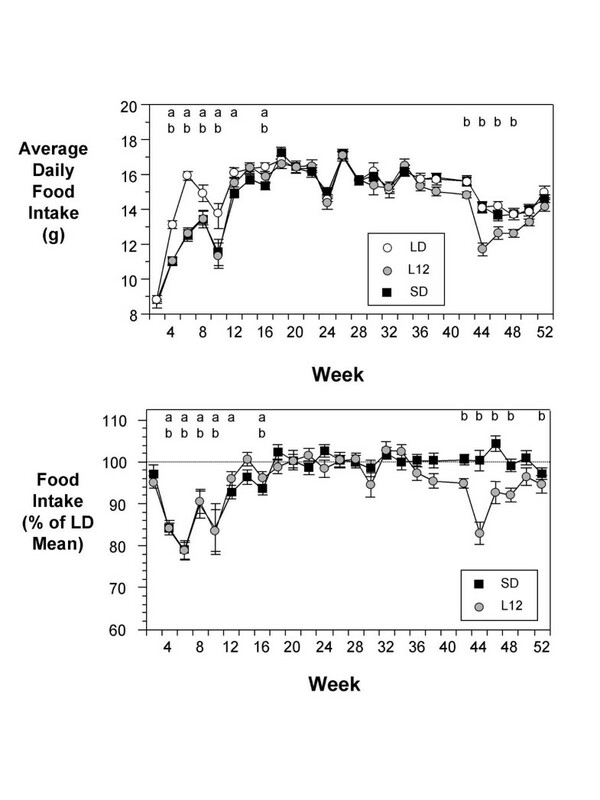 Differences in food intake between SD and LD groups were first significant during the week 4–6 measurement period (Fig. 2b), and the lower level of food intake in SD persisted through the time of the last measurements on food intake during weeks 12–16 (Fig. 2b). Rats put into SD photoperiod treatment from the time of weaning exhibited an initial period of photoresponsiveness during the first third of the experiment (measurements in weeks 2–14). There was a significant inhibition of testicular growth from weeks 2–14 for SD relative to LD (P < 0.0001, F = 82.45; Fig. 3a &3c). There were no differences in estimated testis volume over the middle third of the experiment (measurements from weeks 18 – 30; P = 0.38, F = 0.78; Fig 3b &3d). In the final third of the experiment, the SD treatment group had significantly smaller testis size than the LD group in the test on transformed data (measurements from weeks 35 – 52; P = 0.048, F = 4.28; Fig 3b &3d). This difference between SD and LD groups was not significant in a test on untransformed data (P = 0.06, F = 3.96). Analysis of the untransformed data identified a significant overall decrease in testis size of all of these rats over the final third of the experiment (P < 0.0001, F = 83.77; Fig. 1b). Pairwise comparisons of LD and SD groups identified significant differences in testis size only in the first third and last third of the experiment (Fig. 3). 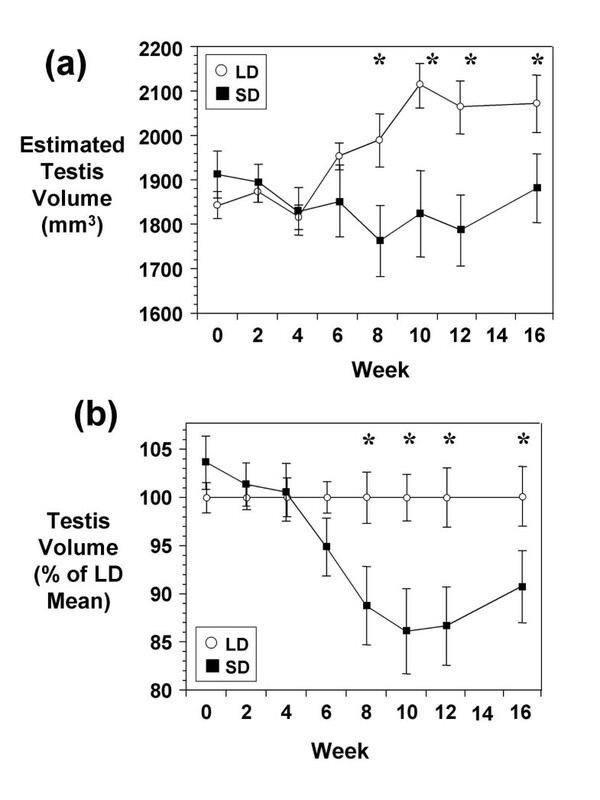 Running three-point means (± SE) of estimated testis volume over 0 – 14 weeks (a) and 18–52 weeks (b), and means transformed to a percentage of the LD mean value over 0 – 14 weeks (c) and 18–52 weeks (d) in F344 rats in LD, INT, or SD. Standard error bars are not shown for data points in which error bars were smaller than the symbols. 'a' indicates a significant difference between the SD and LD groups at P < 0.05, and 'b' indicates a significant difference between the INT and LD groups at P < 0.05. Panels a and b and c and d differ in scale of the y-axis. Rats put into an intermediate photoperiod treatment from the time of weaning exhibited an initial period of photoresponsiveness during the first third of the experiment (measurements in weeks 2–14). There was a significant inhibition of testicular growth from weeks 2–14 for INT relative to LD (P < 0.0001, F = 39.68; Fig. 3a &3c). There were no differences in estimated testis volume of LD and INT groups over the middle third of the experiment (measurements from weeks 18 – 30; P = 0.46, F = 0.57; Fig 3b &3d) or the final third of the experiment (P = 0.56, F = 0.38; Fig. 3b &3d). Analysis of the untransformed data for the final third of the experiment identified a significant decrease in testis size of all of these rats (P < 0.0001, F = 38.85; Fig. 3b). Pairwise comparisons of LD and INT groups identified significant differences in testis size only in the first third of the study and in week 35 (Fig. 3). Truly free-running rhythms generated by an endogenous timer should cause individuals to lose synchrony with each other over time . Thus, if changes in testis volume in the later weeks of Experiment 2 were due to an endogenous timer, then we would predict less synchrony among rats undergoing a second period of testicular inhibition in Experiment 2 relative to the adult rats in Experiment 1 subjected to a sudden, synchronous change to SD photoperiod. To test this prediction, the degree to which testicular regression was synchronized among adult rats exposed to a sudden change to short photoperiod in Experiment 1 was compared to the synchrony of testicular regression in rats in SD in the second half of Experiment 2 (Fig. 4). An F-test for equality of variances was used to compare the variability in timing of minimum testis size for the two groups. The variance for the mean date of minimum SD testis volume was significantly greater in the second photoresponsive period of Experiment 2 than in Experiment 1 (variance ratio = 0.105, F = 0.105, P < 0.0001). Differences in synchrony of testicular regression among rats (a) treated with an abrupt change from LD to SD in Experiment 1 and (b) held in constant SD for 52 weeks in Experiment 2. The x-axis indicates the timing of lowest testis size for individuals relative to the time of the lowest mean testis size in that experiment (time "0"). Rats in SD photoperiod treatment from the time of weaning exhibited an initial period of lower body weight relative to LD controls during the first third of the experiment (measurements in weeks 2–14; P < 0.0001, F = 51.16; Fig. 5). There were no differences in body weight over the middle third of the experiment (P = 0.16, F = 2.10) or final third of the experiment (P = 0.26, F = 1.30). Rats in both groups continued to gain weight throughout the experiment (Fig. 5b). Pairwise comparisons of LD and SD groups identified significant differences in body weight only in the first third of the experiment (Fig. 5). 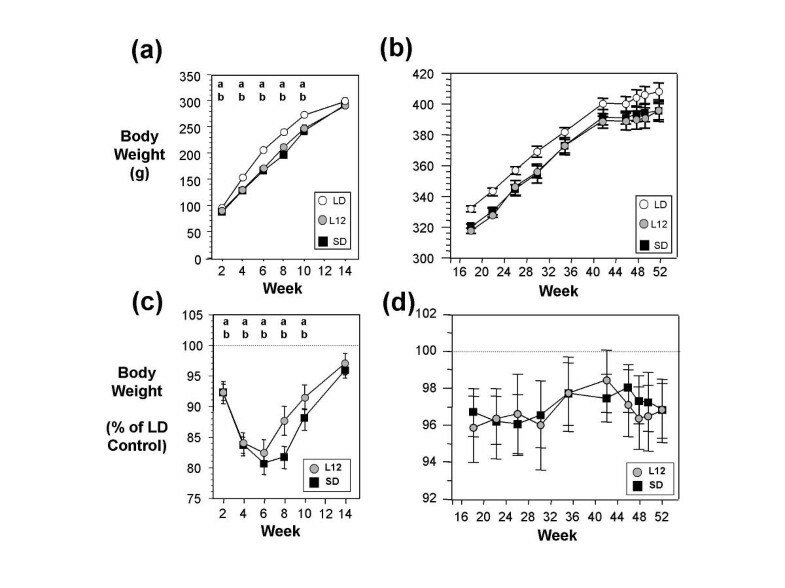 Means (± SE) of body weight over 0 – 14 weeks (a) and 18–52 weeks (b), and means transformed to a percentage of the LD mean value over 0 – 14 weeks (c) and 18–52 weeks (d) in F344 rats in LD, INT, or SD. Standard error bars are not shown for data points in which error bars were smaller than the symbols. 'a' indicates a significant difference between the SD and LD groups at P < 0.05, and 'b' indicates a significant difference between the INT and LD groups at P < 0.05. Rats in INT photoperiod treatment from the time of weaning exhibited an initial period of lower body weight relative to LD controls during the first third of the experiment (measurements in weeks 2–14; P < 0.0001, F = 20.28; Fig. 5). There were no differences in body weight over the middle third of the experiment (P = 0.14, F = 2.28) or final third of the experiment (P = 0.33, F = 0.97). 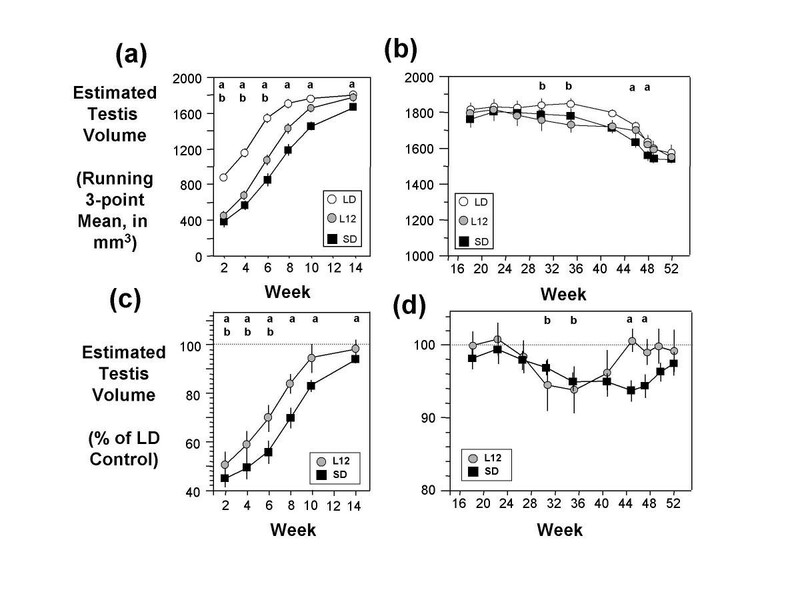 Rats in the LD and INT groups continued to gain weight throughout the experiment (Fig. 5b). Pairwise comparisons of LD and INT groups identified significant differences in body weight only in the first third of the experiment (Fig. 5). Rats in SD photoperiod treatment from the time of weaning exhibited an initial period of lower food intake relative to LD controls during the first third of the experiment (P < 0.0001, F = 23.39; Fig. 6). There were no differences in food intake over the middle third of the experiment (P = 0.82, F = 0.05) or final third of the experiment (P = 0.93, F = 0.01). Pairwise comparisons of LD and SD groups identified significant differences in food intake only in the first third of the experiment (Fig. 6). Means (± SE) of food intake over 0 – 52 weeks (a) and means transformed to a percentage of the LD mean value over 0 – 52 weeks (b) in F344 rats in LD, INT, or SD. 'a' indicates a significant difference between the SD and LD groups at P < 0.05, and 'b' indicates a significant difference between the INT and LD groups at P < 0.05. Panels a and b differ in scale of the y-axis. Rats in INT photoperiod treatment from the time of weaning exhibited an initial period of lower food intake relative to LD controls during the first third of the experiment (P = 0.003, F = 10.43; Fig. 6). There were no differences in food intake over the middle third of the experiment (P = 0.98, F = 0.01). However, during the last third of the experiment (measurements in weeks 36–52) the INT group had lower food intake relative to the LD controls (P = 0.02, F = 6.70). Pairwise comparisons of LD and INT groups identified significant differences in food intake in the first third and last third of the experiment (Fig. 6). As a second measure of reproductive status, plasma luteinizing hormone levels of SD and LD treated rats were assessed at two time points in the first third, middle third, and final third of the experiment. There were no significant differences in LH levels in SD vs. LD during any of the weeks assessed (P > 0.10 for all comparisons; Fig. 7). LH concentration (mean ± SE) in F344 rats at selective time points in LD (gray shading) or SD (black bars). There were no significant differences between treatments. Previous work demonstrated that young F344 rats have a period of photoresponsiveness that delays reproductive maturation, reduces food intake, and slows somatic growth [5, 15], and that these responses are pineal and melatonin dependent [5, 16]. This study demonstrates that F344 rats are also photoresponsive as adults (Figs. 1 &2), with SD inducing lower testis size, food intake, and body weight than LD. Decreases in body weight occurred prior to significant decreases in food intake, suggesting that decreases in body weight might cause the decreases in food intake. In species of hamsters that show photoperiodic regulation of body weight, there is evidence that decreases in body weight in SD can be independent of changes in food intake  or caused at least in part by decreases in food intake . Effects of SD on body weight began almost immediately and persisted for approximately 10 weeks. 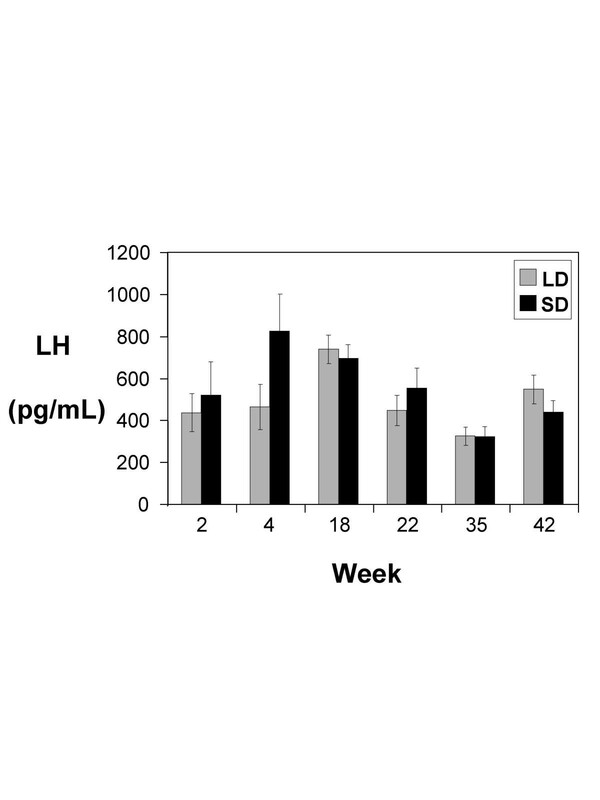 However, between week 10 and 16, body weight of SD rats was increasing with the same slope as that of LD rats (Fig. 1a), suggesting that rats had become refractory to the effects of SD around week 10 of treatment. Testicular responses to SD may have followed a similar period of 10 weeks of sensitivity followed by refractoriness (Fig. 1b). The rapid decrease in body weight of rats in SD, followed 10 weeks later by a return to weight increases, might make this system useful in studies on the control of body weight in mammals. The magnitudes of differences in food intake and body weight in adults were approximately 10–20% (Fig. 2), similar to those in peripubertal young rats in SD (e.g., Fig. 6), indicating that adults and peripubertal young rats have similar non-reproductive responses to SD. In contrast, SD had a greater effect on testis size in peripubertal males (55% smaller testis volume in SD than LD; Fig 3) than in adult males (15% smaller testis volume in SD than LD; Fig. 1). The large difference between the SD and LD groups in peripubertal males was caused by the rapid rate at which testes of the LD group were growing compared to a slow rate of growth in the SD group. In adults, in contrast, treatment effects were due to testicular regression in SD. The proportionately larger effects of SD on peripubertal males are consistent with the hypothesis that young animals are more sensitive to seasonal reproductive inhibition than adults [10–13]. The reductions in testis size of adult rats in SD were slight, and might, by itself, have negligible effects on fertility in adult rats. However, it is possible that the combination of SD with mild food restriction [e.g., ] or other treatments might interact to cause much more significant responses. It is possible that hormonal and behavioral effects of SD might suppress fertility of adult F344 rats even though testis size remained relatively large. In Siberian hamsters, SD can regulate LH secretion and behavioral responses to a female independently of changes in FSH or gross changes in testis size . However, the fact that no differences in LH secretion were observed in response to SD (Fig. 7) suggests that this is not the case in F344 rats. It is also possible that the single point samples were not sufficient to detect differences in pulsatile LH secretion between groups, as has been suggested previously for rats induced to become photoperiodic by androgen treatment . It would be useful to repeat this comparison of hormone levels using multiple samples obtained from indwelling atrial cannulas. Repeat sampling using this technique was not feasible, however, due to the long-term nature of this study. Previous studies on rats have shown that adults of some strains can be made reproductively responsive to SD by manipulations such as androgen treatment [8, 9], olfactory bulbectomy [21, 22] (but see ), or food restriction . An effect of short photoperiod on body weight of unmanipulated adult rats has not been reported previously, but has been reported for unmanipulated young rats of several strains (Zucker rats , F344 rats [5, 15], Wistar rats , and BN rats ). To our knowledge, this study is the first report of reproductive and nonreproductive responses to short photoperiod in adult, unmanipulated rats. The single large and highly significant change observed after the early stages of experiment 2 was a general decrease of approximately 10% in testis size of all three groups that occurred in the last third of the study (Fig. 3). The fact that the change occurred in LD controls as well as experimental groups implicates either a systematic change in measurement methodology of soft testes or a change in some uncontrolled variable. Possibilities for the latter include age effects, a change in the tap water or food, and various forms of stress. This finding highlights the importance of the LD group as an essential control in this study. Without the LD group as a control, this kind of change attributable to an uncontrolled variable would have been impossible to distinguish from the effect of an endogenous timer controlling the response to photoperiod. The change across all groups is similar to many previous reports on 'annual' or 'seasonal' changes of various physiological measures in laboratory rats [e.g., [26–29]]. These previous studies provide evidence for temporal differences among rats held in apparently identical conditions, but these previous studies generally lack the controls necessary to distinguish between endogenous timers, seasonal cues, and effects of uncontrolled variables. In constant SD in experiment 2, estimated testis volume was slightly reduced, relative to LD controls, in the final third of the study (Fig. 3), but there was no effect of SD on food intake or body weight. The changes in testis size were desynchronized relative to those occurring in experiment 1 (Fig. 4), consistent with the prediction that a sudden photoperiod change would result in greater synchrony than would changes due to an endogenous timer. A previous study on Siberian hamsters  reported a similar dissociation between endogenous timing of reproductive and nonreproductive responses to constant short photoperiod similar to the results in experiment 2. Siberian hamsters in constant short days, but not long days, underwent two cycles of a seasonal rhythm in testis size, but reproductive changes in the second cycle were not accompanied by a typical winter molt, and there was inconclusive evidence for a body weight rhythm . However, the results of experiment 2 were not consistent between SD and INT treatments. During the final third of the experiment, there was no effect of INT on testis size or body weight, though food intake was slightly reduced, relative to LD controls (Fig. 6). Pairwise comparisons of SD or INT with LD identified significant differences in only a few weeks of the last third of experiment 2 (Figs. 3, 5, &6). Bonferroni adjustments to probability values on these multiple pairwise comparisons would have resulted in p-values that were nonsignificant for most comparisons during the final third of the experiment. Overall, these results can be interpreted as only weak evidence for endogenous timers regulating a "type II" rhythm  of sensitivity to photoperiod in F344 rats. If endogenous timers that affect responses to constant photoperiod are present, they appear relatively unimportant in adult F344 rats. This study provides strong evidence that transfer from longer to shorter photoperiod can have significant effects on body weight, food intake, and the reproductive system even in adult rats. However, the results provided only weak evidence for an endogenous circannual rhythm in the reproductive system. The effects of transfer of adults to SD on food intake and body weight were particularly dramatic, as they prevented the steady increase in body mass that is typical of ad lib fed rats in this age group. The mechanisms of this voluntary reduction in food intake and change in regulation of body mass may be relevant to the control of eating and weight gain in other mammals. These results have implications for studies on F344 and other photoperiodic strains of rats, particularly because the F344 rat is widely studied throughout the world, and has been the most commonly used inbred rat strain in the United States . The existence of both reproductive and nonreproductive responses of adult F344 rats to short photoperiod, and the possibility for weak endogenous circannual responses to short photoperiods could complicate the design and interpretation of experimental results, especially in the case of long-term studies. Recent reports have documented variability in photoresponsiveness in peripubertal males among laboratory rat strains [5, 6]. The fact that photoresponsiveness extends to adulthood in F344 rats suggests that genetic variation in the presence and strength of adult photoresponsiveness is present among rat strains. If so, then these responses represent another genetically variable trait in the suite of neuroendocrine inputs and regulatory systems that regulates seasonality. There is increasing evidence for genetically based variation in seasonal strategies among natural populations of small mammals [reviewed by [1, 33]] and in laboratory strains of rodents [11, 34, 35]. Identifying and understanding the neuroendocrine basis for this variability in rats and other species will be important for understanding the evolutionary physiology of reproductive strategies and for understanding genetic variation in brain function. Twenty-one male F344 rats were gestated and then raised in long day (LD) (16L:8D; lights on at 0500) to age 22.3 ± 0.4 weeks (mean ± SE) in our breeding colony. Rats were then placed in either a short day (SD) (8L:16D;lights on at 0900; n = 11), or LD treatment (n = 10). The light intensity ranged from 80–120 lux. Treatments were balanced according to age, body weight, and testis volume. Rats were individually housed in polypropylene cages (36 × 24 × 19 cm) and kept at a temperature of 23 ± 4°C. Rats were provided with ad lib access to food (Rat-Mouse-Hamster 3000, Southern States Cooperative) and tap water. Testis volume, body weight, and food intake were measured after 2, 4, 6, 8, 10, 12, and 16 weeks of treatment. Food intake was calculated by providing measured amounts of food in the food hopper every two weeks and measuring the difference between original food weight and the weight of food remaining. In the rare cases in which unconsumed food was present within the cage, the weight of unconsumed food was included in the food weight. Body weight and food intake were measured to the nearest 0.1 g. Testis volume measurements, body weight measurements, and collection of approximately 270 μL of blood were performed under light anesthesia with isoflurane. Testis measurements were taken externally on the left testis using dial calipers by MBS, blind with respect to treatment. In order to check for consistency of measurements, 5% of the measurements were repeated by PDH, blind both to treatment and to measurements by MBS, to determine measurement precision. Testis volume was estimated using the formula for a prolate spheroid (Width2 × Length × 0.523). In previous studies in our lab, external testis measurements have been found to be highly correlated to measurements and weights later taken from the excised testis . Blood was collected in heparinized tubes from a small tail nick, refrigerated at 4°C after collection, centrifuged within 2 hours, and plasma frozen at -50°C until hormone assay was performed. Fifty F344 males aged 21 days were gestated and raised in LD photoperiod in our breeding colony. Rats were weaned at 21 days, and placed into LD (n = 16), SD (n = 17), or intermediate photoperiod (INT) (L12:D12; lights on at 0700; n = 17). Sibling groups were divided among the three treatments, and body weight was balanced across treatments. Rats in each group were housed in individual cages and maintained in fan-ventilated photoperiod-controlled chambers. In each group, 14 rats were held in a single large photoperiod chamber, and the remaining 2 or 3 individuals in each treatment were held in a second, smaller chamber set to the same photoperiod. The LD group was designed explicitly as a control for any changes in husbandry, allowing us to test for changes in the two shorter photoperiod groups relative to the LD group. A number of studies have reported explicitly on seasonal changes in animal colonies, including rat colonies [e.g., [26–28]], that could be caused by uncontrolled seasonal variation in husbandry. These potential differences have included such things as seasonal changes in freshness of food, and changes in water, bedding, humidity, noise, or odors. The LD and SD chambers were in the same animal room, were identical in construction, and received air from intakes that were less than 50 cm apart. The INT treatment group was in a similar chamber in a nearby room. Feeding and watering were identical for all groups. Thus, seasonal differences in husbandry should be controlled by comparing the SD and INT groups to the LD group. Testis length and width measurements, body weight measurements, food intake measurements, and blood collection were performed at 2-week +/- 3-day intervals for the first 10 weeks of treatment. Food intake continued to be measured at 2-week intervals, except for one 5-week interval late in the study. Some rats were inadvertently given an unmeasured amount of food during the 6 – 8-week measurement period; food intake data in that period for those rats were discarded. After the first 10 weeks, testis volume measurements, body weight measurements, and blood collection were taken at approximate 4-week intervals, and then returned to 2-week intervals for the last portion of the study. More specifically, these data were taken at weeks 14, 18, 22, 26, 30, 35, 42, 46, 48, 49.5, and 52. Data collection was carried out as described in Experiment 1. The plasma concentration of LH was determined by sandwich immunoassay with the ORIGEN Electrochemiluminescence (ECL) Immunoassay System. The protocol followed was developed by DR Deaver http://das38.cas.psu.edu/1hecl.htm. A monoclonal mouse anti-bovine LH antibody (generously provided by Dr. Jan Roser at UC-Davis) was conjugated to ORGIN TAG-NHS ester. A monoclonal rabbit anti-bovine LH was used as the capture antibody (generously provided by Dr. J.J. Reeves at Washington State University). Sheep anti-rabbit IgG Dyna-beads M280 (Dynal; Oslo, Norway) were used to link the LH capture antibody to magnetic beads for measurement. Rat LH for a standard curve was provided by A. F. Parlow and the National Hormone Pituitary Program. A linear regression model was matched to the standard curve and used to convert photon counts into LH concentrations in pg/ml. All samples were run in duplicate, and the mean value of each duplicate pair was used as a single data point in all statistical comparisons. All samples from a given blood collection period were assayed the same day, and control tubes that were run every 25 tubes revealed no intra-assay drift. The sensitivity of the LH assay was 60 pg/ml for the 10-μl sample volumes. The mean of the intra-assay coefficients of variation for tubes containing pooled juvenile rat serum, containing LH at a low physiological concentration, was 20%, and the inter-assay coefficient of variation was also 20%. Only plasma samples for weeks 2, 4, 18, 22, 35, and 42 of Experiment 2 were assayed. These weeks represented times at which minimum and maximum SD LH levels should have occurred based on examination of testis volume levels at these weeks, if an endogenous circannual LH rhythm existed. It was predicted that the minimum level of LH secretion would occur slightly earlier than the lowest measured level of testis volume due to the delayed effects of hormonal changes producing measurable differences in testis size. Data on estimated testis volume were converted to 3-point running means before analysis. Measurements of soft testes through the scrotum are particularly subject to measurement error (especially small changes in measurement style over periods of weeks). This class of error has little effect on differences between groups within a single measurement period, but can cause apparent changes between measurement periods. In previous work on rats, we have found that small differences in measurement style between weeks can cause estimates of testis volume to fluctuate by approximately 10% from week to week , and that use of running three-point point means reduces this source of measurement error [e.g. ]. For testis volume, statistical analyses were also carried out on data tranformed by dividing individual data points in each measurement period by a constant, the mean for the LD group in that measurement period. Repeated measures ANOVA, along with Fisher's protected LSD post-hoc comparisons were used to test for changes in testis volume, body weight, and food intake using SuperAnova (v. 1.1, Abacus Concepts, Berkeley, CA). Weekly comparisons of SD and LD testis volume, body weight, and food intake were performed for each measurement period using one-tailed t-tests, with the expectation of SD < LD (Statview v 4.5, Abacus Concepts, Berkeley, CA). One-tailed t-tests were selected because only suppression of reproduction, reductions in body weight, and reductions in food intake have been observed in response to SD in prior experiments on F344 rats [5, 15, 16, 19]. For all tests, P < 0.05 were considered significant. Testis size was not adjusted for body weight. First, there was no correlation between body mass and testis mass in adult rats at the beginning of the study (R2 = 0.01, F = 0.02; P = 0.88; n = 21 rats). In addition, a previous study found that testis weight is not dependent upon body weight in F344 rats . Therefore, adjustment of testis size for body weight using ANCOVA models is not appropriate. For all variables, statistical analyses were carried out in two ways. Analyses were carried out on both the raw data and on data tranformed by dividing individual data points in each measurement period by a constant, the mean for the LD group in that measurement period. The latter approach allowed use of the LD group to control for temporal changes over the year that were independent of responses to photoperiod. In contrast, the former approach provided information on differences that might be due to uncontrolled variables over the year-long experiment. As in Experiment 1, 3-point running means of estimated testis volume were used to reduce the effects of measurement error for testis size. As in Experiment 1, testis size was not adjusted for body weight using ANCOVA models. Repeated measures ANOVA comparing LD with SD and LD with INT were carried out on the first third, middle third, and last third of the 52 weeks. These intervals were chosen because the initial effects of SD on young rats persist for approximately 14–16 weeks [5, 19], and because species that have a type-II annual rhythm generally are photorefractory for a period of at least 15–20 weeks, corresponding to the middle third of our experiment, and then have a second period of photoresponsiveness beginning at some time in the final third of a first year in photoperiod treatment [e.g., see ]. Additional analyses carried out on different time intervals produced similar results to those reported in the Results. Finally, pairwise comparisons of LD with SD and LD with INT were also carried out for each week of measurement using one-tailed t-tests. Bonferroni adjustment of probability values for multiple comparisons in these pairwise t-tests was not conducted. However, the likelihood of significant differences occurring by chance in this series of multiple comparisons is considered in the Results and Discussion. We thank Kristin Schubert, Sarah Joiner, Annaka Lorincz, Eric Galvez, and Michelle Rightler for helpful discussion and assistance with assays and animal care. Dan Cristol and John Griffin provided helpful comments on an early draft of this manuscript. Work was supported by NIH Grant R15 MH62402 to PDH, by a Minor Research Grant to MBS from a Howard Hughes Medical Institute Undergraduate Biological Sciences Education Program grant to the College of William & Mary, and by a Verizon Summer Research Fellowship to MBS. The authors contributed equally to the original ideas, experimental design, and data analysis. MBS carried out 95% percent of the data collection, performed the LH assay, and wrote early drafts of the manuscript. PDH carried out final revisions to the manuscript.